It was 31st of May 2017 around 6:45pm, and I came to know that the CSE-2016 results are out. I opened the holy PDF, with my wife beside me, with much anticipation. I searched for my surname, and there you go – 1014. 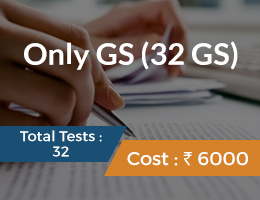 For someone who had already passed this exam (CSE-2015 AIR 932), this number was more of a pain than relief. More painful was to know that I failed the prediction of my dear wife. Oh, How many times I had wished after seeing that result, that my actual rank contained one digit less, say 101 or 104 or 114, I donno! So then and there began my journey for CSE-2017. This time I was pretty clear on the areas I had to work upon, ie everything! My knowledge of optional was shallow, I had not written the optional test series in the past, I had not got my General Studies test copies evaluated, I hadn’t practiced essay seriously nor did I solve the Ethics case studies at home. So it was a huge backlog. Fast forward, though I had known what to do for General studies, I hadn’t implemented nor internalized it. For example, I almost always missed writing a conclusion to my answer in a hurry to attempt the next question. So without proper conclusion, your answer is incomplete and does not make proper sense. Likewise, the introduction would be too long and cursive, thus consuming much of the time and real estate on the answer sheet. Also, not answering the demand of the question, and writing what you know than what is asked. So I tried correcting all these deficiencies this time. 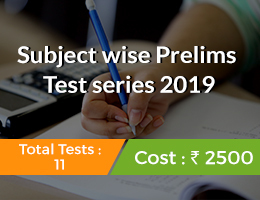 Before writing any mock test, I used to have few objectives in mind like speed/number of questions to be attempted, presentation format including proper introduction and conclusion etc. While writing, I consciously tried to implement them and evaluate my performance after the test. More importantly I got the test copies evaluated this time and worked on the feedback. An aspirant has to balance the feedback he gets with his intrinsic/original writing skills. Adopting every feedback or suggestion will frustrate oneself and he/she loses the originality in answer writing. At the same time, being overconfident about one’s writing skills without paying heed to deficiencies and genuine suggestions will not do any good. Ultimately there is no fixed format or formula for writing an answer. The night before mock tests, I tried cramming relevant facts, figures and reports. I used to imagine starting an answer with the above data in case a related question comes tomorrow. Its like preparing Dosa batter in the evening for the next day’s breakfast. Using flow chart can save space and time. But don’t over do it. A Clarification – Some say drawing more figures and maps and flowcharts etc will fetch extra marks. At the same time writing in point wise is better and many other things. I would like to bring to your observation that, there is no such proven formula. 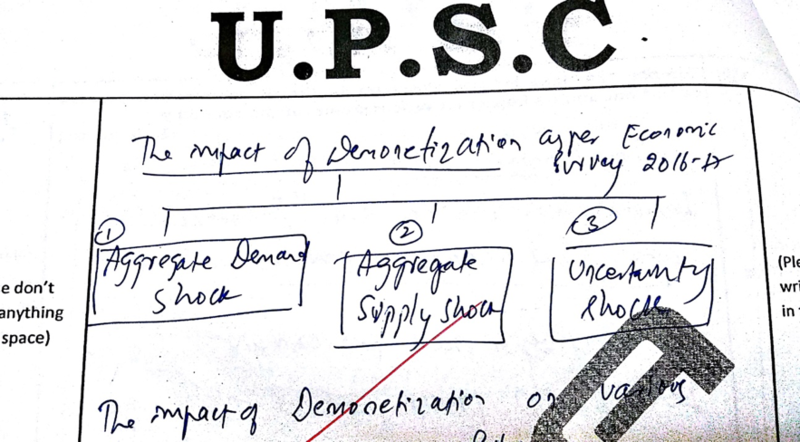 If you observe AIR-1 Gaurav Aggarwal’s answer scripts, you find that he hardly draws any figures/diagrams or flow chart. Nonetheless, his answer content was very good and meeting the demand of the question. So ultimately, it all boils down to relevant and appropriate content meeting the demand of the question. This is one such paper, which can single handedly make or break your rank. I scored 135, 110 and 145 marks last three years. In CSE-2016, I got 110 marks in essay because I went astray in one of the topics, God knows why! So I knew what to do and what not to do specifically this time. This time, my goal was not to experiment too much with the essay paper. Just keep it plain simple, content with the average marks it would fetch. I would come up with a separate article on Essay soon. This is one area where I really toiled. 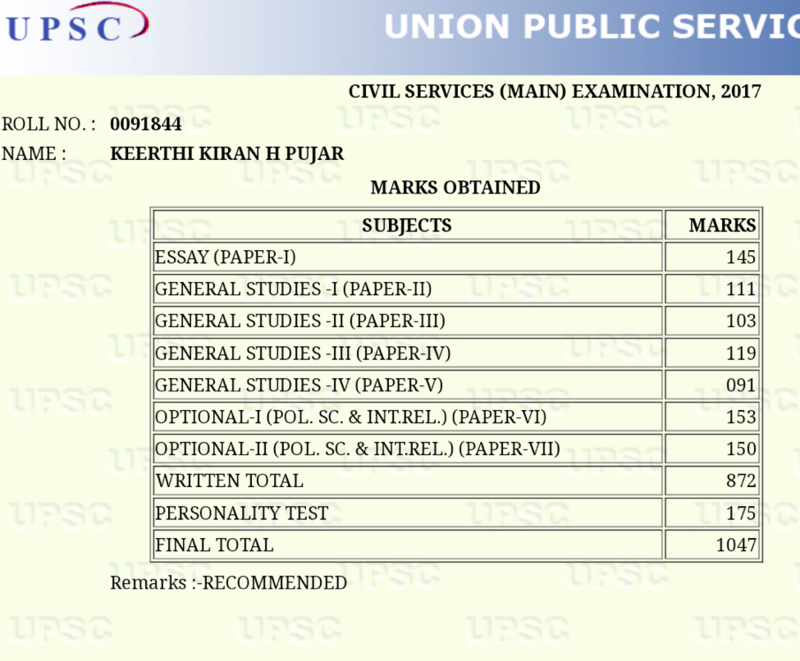 Some people get IAS solely on the merit of optional by getting insanely high marks. While General studies is generic, optional is very specific. What I meant to say is, mastery over the optional subject is sine quo non for a very good rank. For Political Science and International Relations, I increased the sources this time, jotted down relevant notes and tried to update myself with the latest thoughts in the field. More importantly, I tried to interlink thinkers and their thoughts, theory and practice, different view points etc. For example, consider a 10 marks question “Polity, a product of social contract” – Comment; I start my answer saying that the tradition of treating Polity as a product of social contract started with Thomas Hobbes, which was later adopted by Locke and Rousseau. Then I explain the meaning of the statement. Then deal with the variations in social contract theory. But not stopping here, I also talk about how Anarchists like Peter Kropotkin do not view polity as product of social contract. Here comes the interlinking aspect. You can bring up a thought which either supports the statement or opposes it. This makes for a balanced answer. So its upto your creativity and the hold over the subject to write an outstanding answer. But this requires lot of homework! I also have to mention that I derived great joy digging more into the subject and ruminating over the same. Next, I had not written optional test series in my last two attempts. 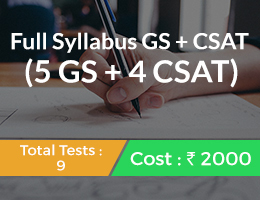 In CSE-2016 I made a half-hearted attempt in writing test series. This time, I left no stone unturned and despite lack of company, I wrote alone all the tests and got it evaluated from a faculty and friends. 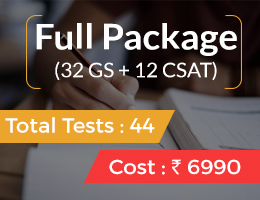 You get a sense of accomplishment writing one test after another with good preparation. A more detailed article on Political Science will follow. This is one paper, where I couldn’t cross 100 marks in all my three attempts. This year, I got 91 which people say is above average after taking into consideration the scaling. Nonetheless, I will give my two cents. I felt I’m at ease while answering the theoretical questions; it came to me naturally. But I had to work upon the case studies. So a month before the mains, I started to solve two case studies every weekday in the evening. I used to compare my answers with the model ones and found lot of scope for improvement. I used to miss many dimensions of a given case study. Also I chanced upon the answer scripts of one of the ethics toppers in CSE-2016. His/her method was to explain in detail the best possible solution asked for a given situation/case. I adopted this. For theory, I would say there’s no need of any text book. After having gone through multiple ethics text book, I’ve not come across even one book, which explains ethics through examples. It’s just the theory. Use a dictionary or internet to understand words like Integrity, Probity, Honesty etc and come up with examples from the lives of great men, women, administrators, celebrities, from your own life etc. For topics like Public/Civil service values and Ethics in Public administration, refer 2nd ARC. Honestly, I was too complacent to take the personality test seriously this time. I was rather content with IRS and the training. I didn’t give even single mock interview this time, not even with friends or batch mates. But since it would be a disgrace to not to answer questions on IRS, I prepared that subject quite decently. I also read newspapers daily especially focusing on World politics. Rest, I went to the Dholpur house without any notions in mind. The interview went well all along except for a hiccup in the end. 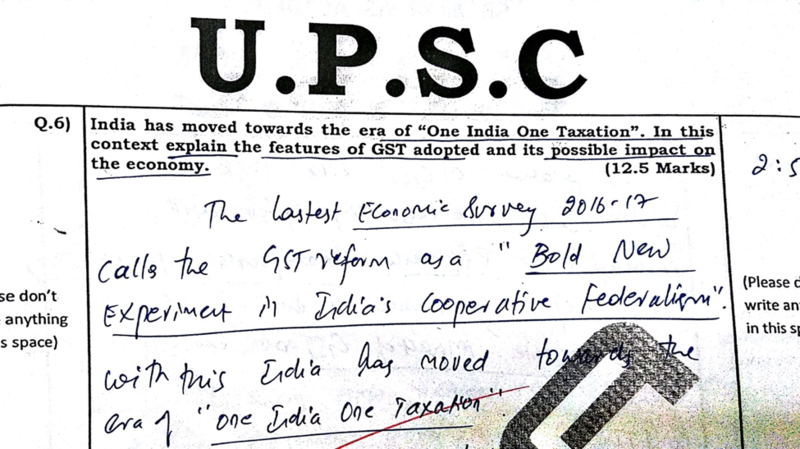 So it was mixed feeling coming out of UPSC building that evening. However, I didn’t worry much post that and resumed my training. 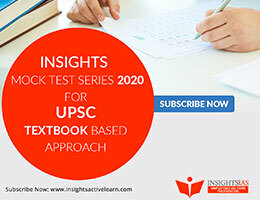 Interview can be a walk in the park if we can prepare from day one of our UPSC preparation. It just takes some curiosity to know more about ourself and things around us. Form a group of like minded friends and allow them to grill you on all aspects of DAF and other areas. For CSE-2016, I did this and was quite helpful this time. I thank InsightsonIndia for providing an environment and infrastructure for this. Vinay of Insights took couple of mocks and asked some challenging questions and his feedback was valuable. Don’t go with an imaginary cutoff in mind. As we have seen last couple of years, Prelims has become way too unpredictable and cutoff has been decreasing. So, on that given day, pray to God that you should in the best of your form, health and spirits to do well. After writing the prelims exam, I relaxed for a week with family. Then started preparing for mains hoping that I would clear the Prelims rather narrowly. This time I had joined Shankar Test series at Bengaluru for both GS and Optional. 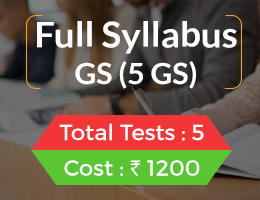 Before the test series started, I gathered relevant notes and revised the syllabus of first three or four General Studies Mock Test, so that I don’t have to study in a hurry a day before the mock test. This gave time for me to consolidate the content in my head and internalizing it. Also I used to work on the value addition part by reading relevant reports and their facts and recommendations. I mugged up few catchy phrases and sentences which were later useful in writing powerful introductions and conclusions. After one month of writing GS test series, I switched gears and started preparing for Optional subject rigorously. Though I was out of sync with the time table of optional test series, later I wrote each test on my own keeping a timer. Uff, I still remember, it was a race against time. Everybody has a particular point upto which they can stretch themselves during preparation. Some may study 6 hrs and others 12 hrs. Find out how much you can and plan accordingly. But don’t put yourselves completely in your comfort zone or don’t be on the verge of a break down. Family support is very essential during preparation. Clarify your position and expectations with your family members. Don’t keep yourself or near and dear ones in an illusion. It does no good if you are healthy throughout and fall sick during exam period. I remember, one of the reasons for poor performance in 2016 mains being bad stomach and loose motion from day one to the last day of the mains exam. I had to take one eldopar tablet everyday before going to exam hall. So keep yourself healthy mentally and physically. You can do some exercise daily for few minutes. 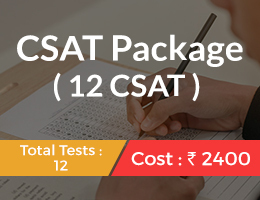 Every aspirant has a doubt about oneself regarding clearing the exam. That is natural. Don’t let those thoughts bog down you. Keep moving. Sounds trite, but find out your strengths and weakness and work upon the same. The sooner you do it, the better. How do you find your strengths and weakness? Talk to seniors, friends and mentors. Again clichéd, but life is bigger than UPSC or IAS/IPS/XYZ. Its not guaranteed you will be happy if you get IAS home cadre. You may be much better off doing something else. So whatever be the dejection or failure or depression, give time some time. There’s no wound that time cannot heal. Clearing UPSC and getting service is just the beginning. You have a whole career ahead to prove your worth. So please keep the momentum going. I would like to end by thanking foremost, my wife who is the main reason for this success. But for her, I would not have done it. I thank my parents and inlaws, my brother for their constant support and encouragement. I thank the Almighty for his Grace. He has given me more than I deserve. I thank Vinay GB of InsightsonIndia for guiding me especially in the initial phase of my UPSC preparation. He always believed that I could do it. I thank the Previous toppers for their valuable insights and articles. Last but not the least, my friends and peers were there to discuss answers and provide timely help. Everyday I used to look forward for a cup of tea with them in the evening and chill out for sometime.